Behold the Dingo Gap, an area that NASA scientists are intent on getting Curiosity to explore. 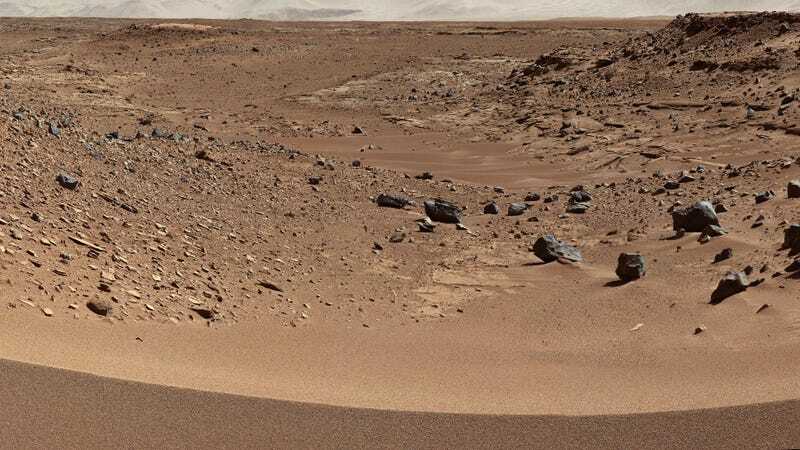 But to get there, the Mars rover will have to climb over a 3-foot (1 meter) sand dune. If done incorrectly, it could mark the end of Curiosity's incredible journey. The incline of the dune shouldn't pose a problem for Curiosity. The concern is whether its 20-inch (50 cm) diameter wheels could get stuck in a sand trap. There's also the potential for any rocks hidden inside the dune to damage or trap the rover. Mission planners have a right to be worried. Its Spirit rover was lost in a sand trap in 2009, and in 2005, the Opportunity rover became stuck for several weeks in a deep dirt pile later dubbed "Purgatory Dune." Curiosity is currently testing the sand's consistency with its wheels. A final decision on whether to pass through this valley will come after an evaluation of a short drive planned later this week toward the top of the dune that lies across Dingo Gap.